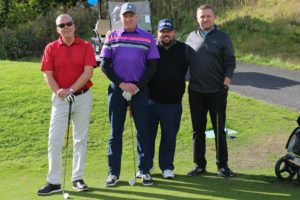 The annual Northern Bear charity golf tournament, held on 4 October at the Ramside Hall, Durham, and a subsequent donation agreed by Northern Bear’s Board of Directors has raised £10,000 for St Oswald’s Hospice. The winning team from Pulman Volkswagen. From left: Steve Rose, Keith Ramshaw, Lee Myers, Steve Swainston. A total of 88 golfers took part, in teams of four representing companies from the Northern Bear group and its clients and suppliers. One of the sponsors, Pulman Volkswagen, added to the excitement by offering a new Polo for anyone who hit a hole-in-one (nobody did), so it seemed appropriate that their team won the tournament. Participants were also treated to an extraordinary show by widely acknowledged champion of ‘trick shot golf’ David Edwards. The relationship between Northern Bear and St Oswald’s Hospice started in 2016 when the company chose the hospice as its local ‘charity of choice’ to help commemorate a decade of trading on the Alternative Investment Market of the London Stock Exchange. Since then Northern Bear has raised over £30,000 for St Oswald’s Hospice.